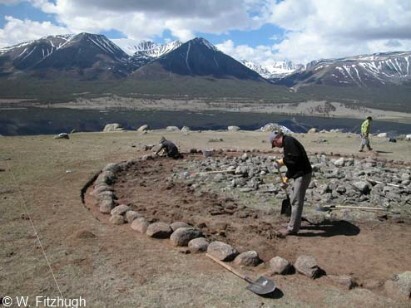 This project builds on the successful Khanuy Valley Project by reforming the same team of researchers in order to try to understand the nature of the social and economic organization of Bronze and Iron Age societies of Mongolia through the use of regional survey and settlement archaeology. The project focuses on the Altai region of western Mongolia, a region featuring monumental architecture distinct from that in contemporary eastern Mongolia, to test hypotheses of cultural and subsistence development established in the previous research project. We will also be collaborating with another research team from the Smithsonian Institution and ETSU who are investigating the region’s rock art and ritual landscape in the same region. Located in the steppes of western Mongolia, the research area is dotted with impressive stone built burial and ritual sites dating to the second and first millennia BCE, and continues to be inhabited by horse-riding nomadic pastoralists who have maintained much of their traditional lifeways.